Physician Jabbar Fazeli works in his office on Washington Avenue in Portland on Monday. Fazeli's brother, Adnan, probably died at age 38 while fighting for the Islamic State overseas. 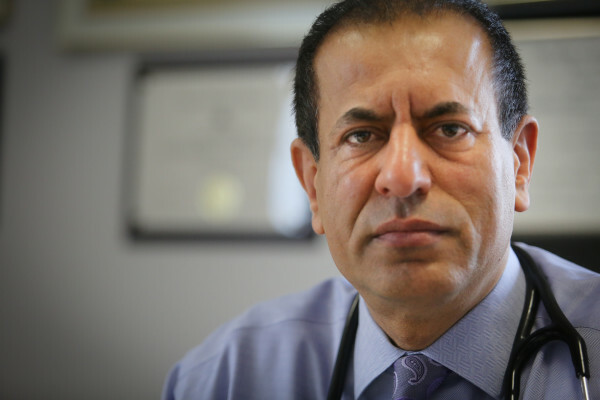 Physician Jabbar Fazeli sits at his desk in his office on Washington Avenue in Portland on Monday. Fazeli's brother, Adnan, probably died at age 38 while fighting for the Islamic State overseas. That’s why, at the end of this year, we wanted to find out “whatever happened.” For the next few weeks, we’ll be touching base with several Mainers whose stories came to attention during the year. What we found may sadden, delight, or surprise. In all cases, we hope you enjoy them. PORTLAND, Maine — To many people, Adnan Fazeli is a dead terrorist. When details surfaced in August of an FBI investigation into his ties to the Islamic State, the one-time Maine resident also became a political flashpoint, personifying the schism in America over our treatment of refugees. To Jabbar Fazeli, Adnan was a brother. One he still hopes to find. Adnan’s body is somewhere overseas, likely in Lebanon, where he’s believed to have died at age 38 while fighting for the Islamic State. His death was the culmination of a descent into Islamic extremism that federal investigators discovered took root after Adnan moved here. While Jabbar denounced his brother’s activities and reported him to the authorities, he still yearns to bury his brother near their parents’ home in the Iranian province of Khuzestan. Recent developments suggest that the worst of the conflict in neighboring Syria may have abated, meaning locating his brother could one day become a reality, Jabbar said. “Maybe in a few years I could go and take care of finding Adnan,” he said. Until then, he continues his attempts to reach out to Adnan’s three children, whom Jabbar has seen only once in the last few years. He’s not even sure whether they know the circumstances of their father’s death. So, like he did last year, he will send them Christmas presents through a relative and hope the children receive his offerings. A globe for one child, an educational game for another, and a microscope for the youngest. “I never hear back,” he said. He remains leery of speaking out about his brother, fearful that the electronic footprint of his words about Adnan could pain the children in the years to come. As they grow, their adopted country will continue to reckon with its openness to families such as theirs. While the election of Donald Trump has instilled fear among many immigrant communities, Jabbar sees a silver lining — the expected cuts to welfare benefits for immigrants. Adnan, who traveled to the U.S. legally, relied on public assistance. Jabbar, a well-known physician in Maine, believes it robbed Adnan of the motivation to find a job and fully participate in American society. Had he found work in Maine, Adnan may have proved less susceptible to terrorist recruiters promising money and stature, Jabbar said. Correction: An earlier version of this story misstated the timing of Jabbar Fazeli’s last visit with his brother’s children.